We flew from Newark, Airport (NJ) direct to Mexico City ($350 round trip), spent a night at the Galleria Plaza Hotel ($185 night US but worth it as the accommodations are 4 star) in the Zona Rosa section of Mexico City (elev. 7300 feet). Staying in the Zona Rosa, one of the nicest parts of the city, is a great way to both ease into the local culture and offers a night of acclimating to the altitude as we live at100 feet above sea level. On day two we made our way to the Topo Bus Terminal and caught a first class bus (no AC on the second class bus system) ride to the city of Puebla. There we caught a connecting bus to the small town of Tlachichuca (elev. 9200 feet) where we stayed at the Senor Reyes climbers compound (see http://www.servimont.com.mx/). 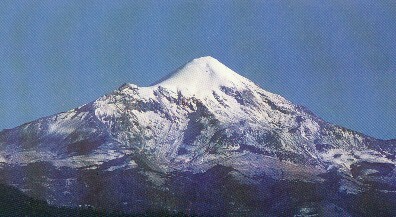 The facilities and services here are top notch and set-up solely for climbers attempting Orizaba. The basic package price is currently (3/2001) $110 US per person and includes two nights of lodging, and the two-hour four-wheel drive ride to and from the mountain trail head and huts. Also included in this price are two dinners and two breakfasts. Day three we made our way up to the huts at the14,000 foot trail head in pretty nasty weather. Once there we promptly negotiated with four guys from Vermont who were catching the truck back to the compound for their remaining water and wands. Water - there is a natural source at the huts, but I suggest buying a five gallon jug at the Reyes store and bring that up with you in the truck, if only for convenience. In all of our pre-trip planning and information gathering no one suggested this, so I'm doing it here. There are two huts at the trail head, one that accommodates 40-50 people and a smaller one (the Pellet Hut) that sleeps six (three of four comfortably). We promptly settled into the smaller hut as Francisco, the manager of the compound, warned us that a group of thirty high school kids from Mexico City would be arriving later that day for an overnight stay at the big hut. Needless to say, we lucked out in having the small hut to ourselves for our stay on the mountain. The report from the big hut the next day was that the kids were acting their age and romping around the hut all night. As an aside, the impression I left Mexico with after our attempt on Ixta a couple of years earlier was that Mexico was poverty stricken and no one had money. On this trip however, I came hope with a new perspective on this notion. Of the fifty or so Mexican nationals we met on the mountain, they all appeared to be doing quite well, as many of the kids in this group were wearing North Face and Mountain Hardwear (not cheap) apparel and were well equipped to be on the mountain. Most were bilingual, and one of the kids kids let us know that he rooted for the Yankees and spent this past New Years Eve in Time Square. As it was astutely put to me by someone we met on the trip, Mexico is divided into two groups -- the haves and the have nots, with the country being void of any real middle class presence. Just an ignorant "ugly American" observation. During our first night in the hut a snow storm raged with high winds all night dumping about a foot of snow around the hut by the next morning. We spent the first afternoon and evening plugging holes in the roof to prevent the snow from coming in. I think it is up to Senor Reyes to make some improvements on at least the small hut. It desperately needs a new roof. Orizaba currently is the only mountain in Mexico that is open for business, because Popo and Ixta are closed due to Popo's recent volcanic activity. With this, Reyes has to be seeing a boon in his business as he is the lead service bringing people up to the Orizaba trail head. Senor -- open the wallet and pull out a few pesos for a new roof on the huts, por favor! Our initial plans called for us to spend the first night in the hut, then climb up to 15,600 and spend another night acclimating in our tent. By taking this approach, two hours of climbing would be cut from our summit attempt. Well, guess who forgot to pack the tent poles? Moi. So on day four the three of us hiked up to about 15,300 for our acclimatization hike and made our way back down to the hut. It was on this hike that Katy realized the altitude was going to prevent her from attempting the summit, as she experienced a severe headache, a common, but not dangerous, effect that altitude can have on climbers. See...Diamox isn't a cure-all at elevation after all. Sunday morning (my birthday), Nick and I awoke at 12:45 AM (I got two hours of sleep) and were on the trail by 1:35 AM with clear skies and a brightly lit half moon. After two hours of climbing we met up with a group of climbers from Mexico City, who were on the mountain training for a trek to Everest Base Camp in Nepal later in the month (more haves). They were just leaving their campsite (where we should have been camping -- ouch) to make their way up the mountain as well. Nick and I tucked in behind the group and followed them up through the rock field that used to be home to the Tongue Glacier (it has since melted off ). Navigating through the rock field is quite a time consuming, route finding challenge, and we were glad to be following the guided group. I felt it was a little like hitch hiking and we had caught an excellent ride. After a couple of more hours of climbing we made our way onto the mountain's main glacier at about 16,600 feet. Here Nick and I donned our crampons and roped up for the accent up the mountain. Crevasses don't really come into play on Orizaba as we only stepped around one on the way up. However, we were roped up in case of a slip as the grade is very steep and the glacier was more ice than snow. We were told that the mountain had claimed ten lives this past season (sounds like a rumor to me) -- all supposedly due to climbers not being roped up. Once on the glacier I really began feeling the lack of oxygen and breathing, and for me, became very difficult. I would take about ten steps then pause for a moment to catch my breath. Nick, who is in incredible physical shape (and posses patience's of a saint), wasn't having the problems I was breathing. After a few hours of hard work we made it to the crater rim (18,200 feet) at about 10:30 AM. 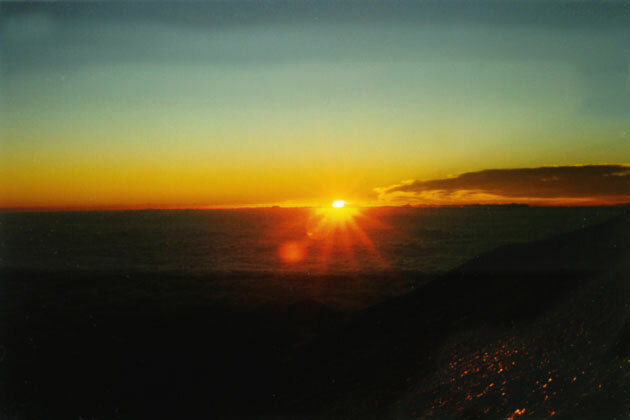 A view looking into the volcano crater. Upon arrival, I sat down and was literally snoring after about two minutes. Nick couldn't believe what he was witnessing. The actual summit is another 500 feet above this point and half way around the huge crater rim from where we were. I had to call it quits at this point because of shear exhaustion and time limitations. We had a four hour trip back to the hut and our ride (which we didn't want to miss) back to town was arriving at 3 PM. This meant that after a short stay (nap for me) at the rim, we had to make our way back down the mountain. Exiting the glacier back into the rock field at the right place is pretty tricky. I suggest planting some wands in this area on the way up so you'll know what to aim for on the way back down. On our descent I'm afraid we got a little to close (my navigating) to Sarcophago Rock and had to gingerly cross over a number of covered up crevasses. A little scary. After four hours of descending Nick and I arrived back at the Pellet Hut where Katy had watched our progress on the mountain all morning. Due to more poor planning, Nick and I had the *one* tube of sun screen with us on the climb, leaving Katy's face exposed to the sun all day without any sunscreen. Needless to say, she experienced third degree burns on her face. With the cool wind blowing at 14,000 feet, she had no idea she was getting as sun burned as she did. Another obvious recommendation - lather up with 15+ early and often while anywhere on the mountain. The inside of my throat was actually burned by the sun reflecting off the glacier into my open mouth that was gasping for air the whole way up the mountain. It was sore for days afterwards. Just as we finished up packing, our ride back to town showed up (Reyes' guys keep to a very real and tight schedule). Once back at the compound, we all showered up and had a great dinner. There were two other groups with us at the dormitory when we arrived. Three guys from Virginia and a small group from Vermont. They were all gearing up for separate guided climbs up Orizaba later that week. That night we enjoyed a couple of climbing movies on Senor Reyes' big screen TV (50 something inch). If you're planning on staying at the Reyes compound, a great gift would be a VCR tape or two (no DVD player yet). After breakfast the next morning, we made our way to the bus station for our trip to Puebla. At Puebla we parted from Nick who had to get back to NYC the next day and Katy and I spent that afternoon site seeing and shopping in Puebla's historic district. The following day (Tuesday) we made our way back to Mexico City and the luxury of the Galleria Plaza Hotel. Wednesday we rented a car for an hours drive north to the Pyramids of the Sun and Moon which were spectacular and not to be missed if you're ever in Mexico City. Thursday it was back to New Jersey. Now for a bit of irony -- everyone has heard that one should not drink the water in Mexico for fear of the effects of Montezuma's Revenge. We were diligent about this the entire trip. Well, at the airport we learned that we were upgraded to first class for the trip home as I have some clout with Continental Airlines. Well, during the flight home I enjoyed both my shrimp cocktail and Katy's. I think the shrimp was bad (tasted good at the time) and I've been suffering with "the Revenge" for six days now.